This is a really historic lawsuit. Interesting reading for legal wonks. The complaint revolves around a due process claim based on FERC's funding mechanism. 17) For example, since the funding mechanism was put in place: the Commission has approved 100 percent of the pipeline projects that it has voted on; the Commission has never issued civil penalty to a pipeline company for a violation of the environmental terms of its Certification; the Commission has never issued an Environmental Assessment finding potential significant impacts for a pipeline project necessitating further environmental review; the Commission has never granted a rehearing request to a non-industry party; the Commission has adopted biased policy objectives in favor of pipeline companies; and the Commission has left unfunded a Congressionally authorized Office designed to assist non-industry parties in participating in the Commission's administrative process. I did some research on the bit about the EA after I learned that many significant projects were being fast-tracked, no full EIS. The problem is, according to the NEPA guidance docs by the CEQ: after the EA scoping, there needs to be a determination of a "Finding of Significant Impact" (FOSI) -- which triggers a full EIS, or a "Finding of No Significant Impact" (FONSI), in which case the environmental review is done. 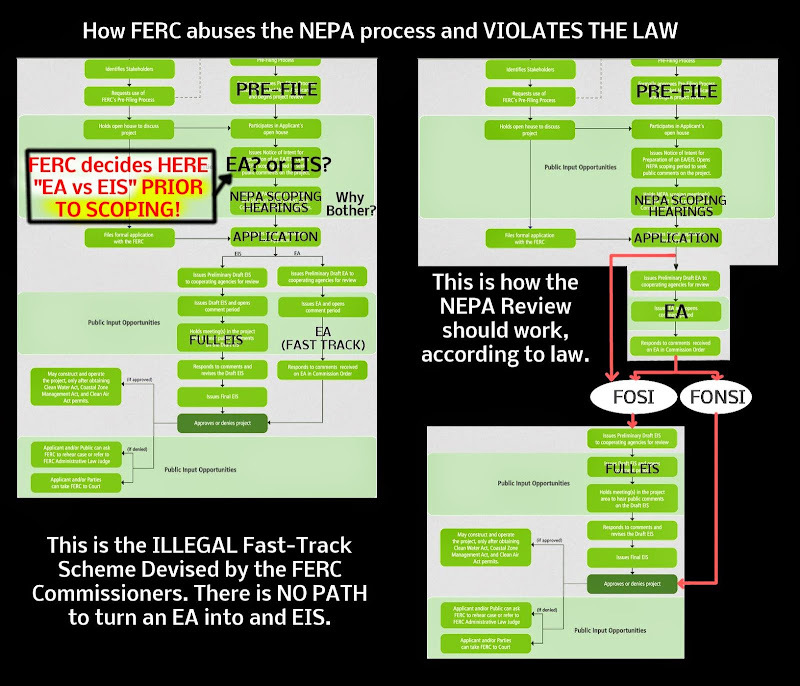 The problem is, FERC terminates the EA process with a FONSI... IN EVERY CASE! This means that FERC is pre-deciding the EIS vs EA decision *prior to scoping*! FERC admits this in their permit flow chart on their website!! And I also have a FERC rep (Paul Friedman) admitting this to me at a hearing. (I think I have video of this somewhere). So why even bother with scoping at all then, if public comments are ignored? This is a historic case. Feel free to share with other groups fighting FERC projects.